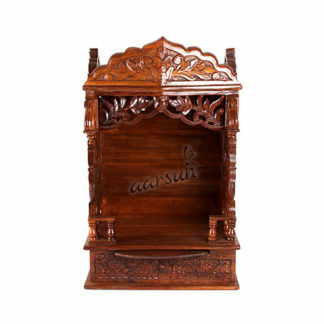 Aarsun Woods bring to you the handmade wooden temple made up of Teakwood with Antique traditional finish.There is beautiful carving done by our skilled artisans.Material Details : Teak has greater naturally weather-resistant properties than just about any other type of wood. When dried to a proper moisture level (around 10 percent of its authentic content), the oils and rubber waterproof the wood. Teak wood is a hardwood obtained from broad leaved deciduous trees, and it is exceptionally strong, not only when compared to softwoods but also when compared with most of the other hardwood trees. Caring: Use a table cloth or any thick quality cotton cloth to wipe it clean. To protect it from fading, avoid keeping the product near windows where it can be exposed to direct sunlight. Do not keep warm items directly on a furniture surface. Availability: Custom Sizes Available as per Requirement. 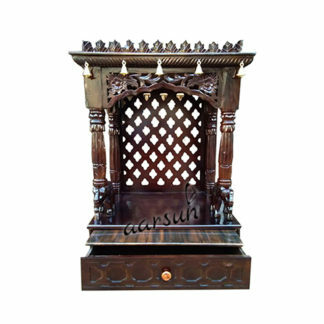 The Wooden Temple is dispatched in dis-assembled state (knock-down-manner) and can be assembled in minutes without any assistance of any carpenters. For instructions video, click on the link for our YouTube Channel .